Why Do We Need Best Sous Vide Racks? 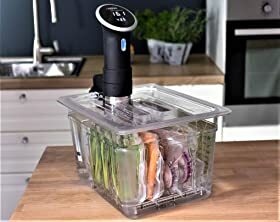 What Is The Best Sous Vide Racks For Home Cooks 2019? As a home cook, when I did my first sous vide, I just used whatever I had on hand – Ziploc bag with handle and a pot of water. To keep the bag in place, I used a barbecue stick placed on top of the pot. It did work, but it wasn’t a safe way of doing it, and I realized that when I finally bought my own sous vide equipment. When I finally saw a sous vide rack on sale, I bought one, and it is more efficient, safer and easier to use. Even if you don’t have proper sous vide equipment, I think you should still go ahead and invest on sous vide rack at the very least, and I will tell you why. 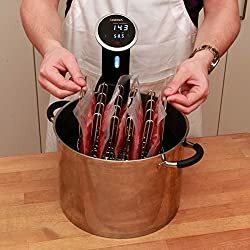 Easy to cook sous vide in batches. Because there are many slots for food bags on the rack, we can sous vide many servings at once. There can be a chicken in one, meat in the other, vegetables in some. It helps cook bagged food evenly and consistently. When our bags are separated by the rack and don’t stick together, each bag is evenly cooked. Without the rack, bags may stick to each other, and some sides may not be cooked properly. It is easier to remove the bags from the water bath. The rack makes it efficient and safer to put the bags in and to remove them from the water. It keeps the bags in place, without the need for clips. The best racks are adjustable and can be moved to tighten the space to ensure the bags will not float around. In a nutshell, when I didn’t have my sous vide rack yet, the bag would float up and not stay under water. This resulted in one side of the meat not evenly cooked. With the sous vide rack, my bags stayed in place without the need for clips or heavy items, and because they are well organized, space is maximized, I can sous vide more steaks than usual easily and fast. The sous vide racks come in different brands, sizes, and even models. To choose the best one, we need to review the features, advantages, and disadvantages of each. SIZE. Consider both the size of your sous vide container and the size of your rack. It goes without saying, the rack should fit the container. Lipavi, my favorite brand, comes in four different sizes. Personally, I would recommend mid-size. Too small and it would be limiting your capacity; too big and it may be just a waste of good money. QUALITY. Best quality is made of stainless steel that will not rust or corrode over time. Once rusted or corroded, it would not be safe to use as it may break during use. FLEXIBILITY. I would say get the rack with dividers that can be adjusted to accommodate different thickness of the bags. The dividers will tighten the bags to ensure they stay in place and don’t float up or around. If the dividers cannot be moved, then we would need to fill the bag to the size that it would fit snugly between dividers. STORAGE. I would recommend collapsible one so when not in use, it will be just flat, compact and easy to store. Although if it is not collapsible, it is still okay as you can store it inside your sous vide container. USABILITY. 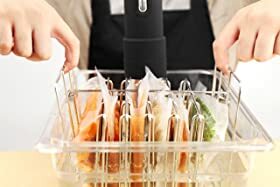 It has to be compatible with different brands of sous vide container like Rubbermaid, Lipavi, Everie, Camwear or whatever container you use for sous vide. Lipavi is a trusted company that has been manufacturing sous vide accessories for many years. They have containers, lids, racks and much more. They are always researching and improving their products to optimize the sous vide cooking experience. That depends on your preferences and what you have. Important note: please check the size of your water bath carefully before buying. Right size for a family of 4-6 people, but also with sizes for a couple and family + friends. Durable material that is rust-free. Dividers can be moved to fit the bags in between snugly. The end handles make it safe and more convenient to put in or take out of the water bath. More affordable than the other model. It lacks a crossbar to block lightweight bags. My favorite part of the Lipavi rack are the handles, which mostly are the last dividers that are taller than most. This design makes it easier and safer to pull up or put in the rack inside the water bath. One, put something heavy inside the bag like weights specifically for sous vide or even just a spoon. Two, we can use clips to hold the bags firmly in place by clipping them unto the divider. Three, if there is a spare divider that is unused, we can put that on top like a cover to keep the bags down. 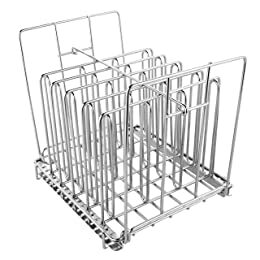 Overall, although there is still a need for further improvements, these racks of Lipavi are still the best choice because Lipavi has a variety of rack sizes to suit every user’s needs. 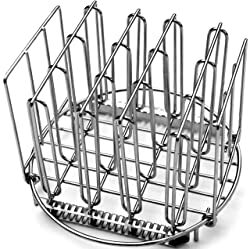 This is also a best sous vide rack for 12-quart containers. It provides a better ability to resist floating bags than Lipavi with a crossbar on the top. However, the limitation of this supplier is only available in one size. 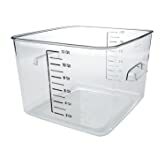 It is usable with more brands of sous vide containers. Dividers can be moved to snugly fit the bags in between. Has fewer dividers compared to the square one. The end dividers are not taller so in essence, there are no handles. Comes only in one size – medium. It will also be better if there is a crossbar. Since both are Lipavi, they are made of the same quality material, so that is not an issue. Both are collapsible, and the dividers are adjustable. The round has more dividers, but only by one. However, the square one comes in more sizes even up to family + friends size, while the round one is limited to just one size. It comes down to square vs. round. The round Lipavi rack is more flexible because it is compatible with more sous vide containers. 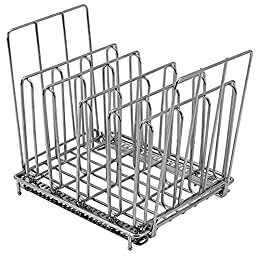 Plus, for home cooks who do not have fancy equipment, we can still use this rack when we are using our ordinary pots for the water bath. Although it is best to have proper sous vide containers and other sous vide gear like vacuum sealer, blowtorch, etc. these may require a bit more investment so we can make do with what we have. 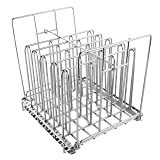 However, even without the fancy sous vide container, I would still suggest getting this rack so our sous vide will be more orderly, more effective and definitely safer. Before I got my sous vide racks, doing sous vide was topsy-turvy. I would clip my sous vide bags along the edges of the pot. I also tried using weights to weigh them down by putting spoons inside the bags. A few times, there were risks in getting the bags out of the hot water bath. All these resulted in meat not evenly or thoroughly cooked; some even resulted in spoons blasting through and ripping the bag apart and wasting meat in the process. As home cooks, our priority is to cook it right and to be safe while preparing. Get the best sous vide rack to make cooking in batches easier than ever. The steaks will be evenly-cooked, and we can enjoy the process as well.